It’s no secret: canned wine is everywhere, and it is skyrocketing in popularity. Like rosé, it once had its skeptics, but today it’s poised to be this summer’s tour de force. And what’s not to love? It’s eco-friendly, air-tight, and perfect for keeping wine fresh and young. What’s more, it’s an easy accompaniment to outdoor summertime living--cans are portable, unfussy, and discrete. Cans also provide a very stable environment--no light or oxygen can penetrate it, so your wine stays fresh. We’ll never see first-growth Bordeaux in a can (I feel like I can say that pretty confidently), but for early drinkers like rosé, it’s a remarkably competent vessel. Here’s the rub: it’s cheaper too. Clearly I’m no soothsayer on the canned wine front--the numbers prove it: Canned wine sales surged 125 percent during 2016, then another 54 percent in 2017. Today it stands as a $28 million industry (figures from Market Watch Magazine). Producers are drawn to cans because they are much less expensive to purchase, fill, and ship. Because they are lighter and more compact for shipping, they have a smaller carbon footprint than their glass bottle counterparts. They’re less fragile, too, so don’t require as much thick cardboard to keep them safe in transit. According to Slate, transporting a can emits 20 percent less greenhouse gases than a bottle. Glass is actually more environmentally friendly to make than aluminium, but all told, after adjusting for transport and recyclability, the can is the greener option. As few as five years ago, there was nary a can of wine to be found aside from Sofia Coppola’s bubbly--sparkly pink, complete with straw. Though Baroke’s of Australia first started canning their Shiraz and Semillon/Chardonnay back in 1996, it took nearly two decades for it to catch on in any meaningful way in the U.S. market. Among the first producers to popularize the can was Union Wine Company, an operation out of Oregon whose motto is “drink with your pinkies down.” Ryan Harm started the company in 2006 with a mission to prove that Oregon wine doesn’t have to be expensive for it to be good. He built his business around producing high-quality wine efficiently and affordably. Their Underwood line of canned wine, first released in 2014, is a testament to that. Around the same time, winemaker Andrew Jones of Field Recordings Wine began tinkering with cans. He first released his juicy, delicious Fiction red blend in a tall boy, and it was so popular that brought it back. He now has a separate line called Alloy Wine Works, devoted to varietal wines in tall boys. The Jackhammer/Jillhammer project started in 2011 when old friends Stephen Dooley (owner/winemaker at Stephen Ross Winery) and Sandy Garber (owner/founder of Garber & Co. Wine) set out to make excellent, affordable Pinot--that actually tasted like Pinot. They both had been in the wine biz a long time, and had great contacts who helped them source high-quality fruit at a good price. 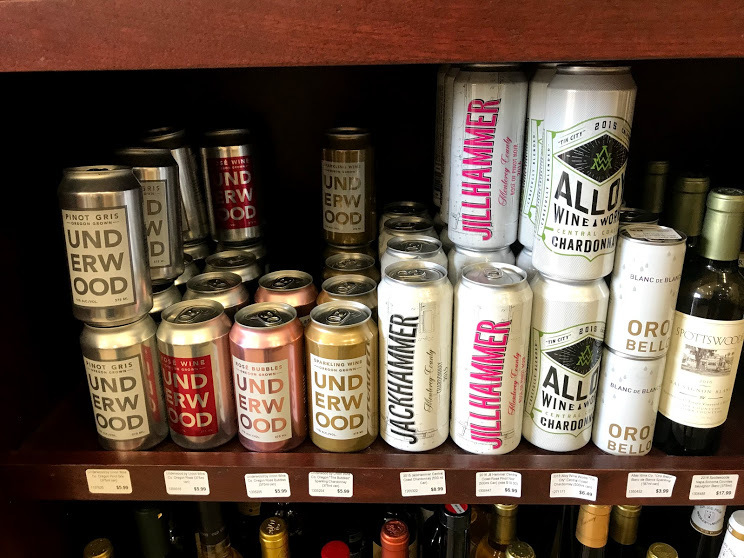 Also in tall boys, they produce the Jackhammer unoaked Chardonnay and the Jillhammer rose. Oro Bello is a Napa-based project from the team at Atlas Wine Company. Their goal with Oro Bello is to make wine from high-quality fruit from hidden-gem vineyards. Single-serve (187ml) cans of blanc de blancs hit the spot. Wine Enthusiast dubbed them a Best Buy. One thing to keep in mind with wine in a can is that you can’t really get your nose in there to smell it before drinking. So, pour into a glass for best results--or, better yet, for ultimate summer refreshment, pour them into a Govino. These have been a staple on my shelves for years. They are made of inert plastic, meaning you can actually smell the wine in the glass. Also meaning you can't break them, as I'm wont to do. Summer solved. You’re welcome!